Even though Estonia was under Soviet rule for quite a long time, it still managed to keep its own traditions. Over the years Estonia has made enormous progress and became a very modern and technologically developed country. However, the nation never gave up on its cultural heritage which is still successfully practiced all around the country. Crafts are important for the local inhabitants and is highly valued as the expression of the identity of Estonians. Different forms of crafts (for example textiles) have become popular and now represent Estonian cultural heritage. You may think that the original Estonian handicraft examples are not accessible in Europe, but you are wrong. Nowadays the museums of Estonia are filled with a lot of handicraft examples from the past which are now classified as folk art. The people value their heritage and try to figure out the connections between people and artifacts, which are quite hard to understand. Locals used to create pretty clothes, work tools, textiles and other useful things both for entertainment and for everyday use. Hand knit sweaters, hats and gloves are an Estonian specialty. Estonian folk art traditions date back to ancient times when clothes, tools, footwear, utensils, and toys were made by hand. Craftspeople of Estonia were already famous for their skills during those times. Cardigans, woolen sweaters, mittens, and socks were knitted with elaborate patterns and each county had its own characteristic pattern. Striped, multicolored skirt fabrics were produced of yarn dyed with herbs while blouses were created of linen and embroidered by hand. The traditional jewelry is made of silver. 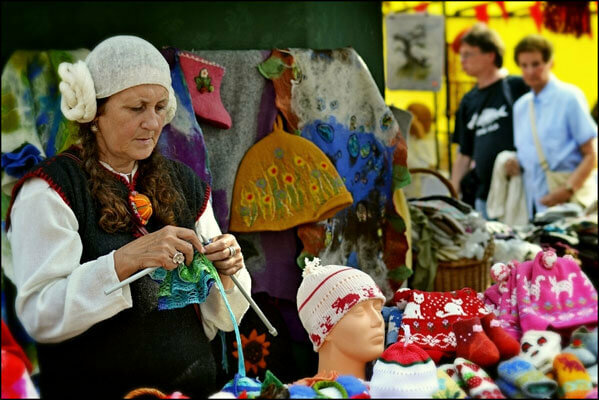 Even today many Estonian people love to knit and prefer hand-made crafts. Unfortunately today there is a thread of losing the national cultural heritage because of the pressures of globalization. There have already been efforts to protect and develop traditional Estonian crafts. In order to save the traditions, one has to be honest and follow well-functioning instruction. Instead of just acquiring craft skills, the person also has to learn the canons of taste and gain some secret wisdom.